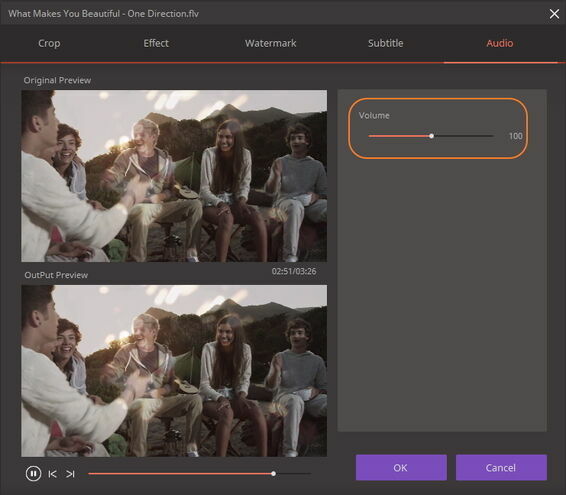 Here's a simple handy guide for you to add subtitles to MP4, AVI, MKV, any video format as well as your digital/DVD movies, TV series and music videos. Note that there're tiny differences between Windows and Mac version, make sure you're following the corresponding tutorial. To get started, you need to add video files to the program first, where you'd see 3 editing icons under the video thumbnail. 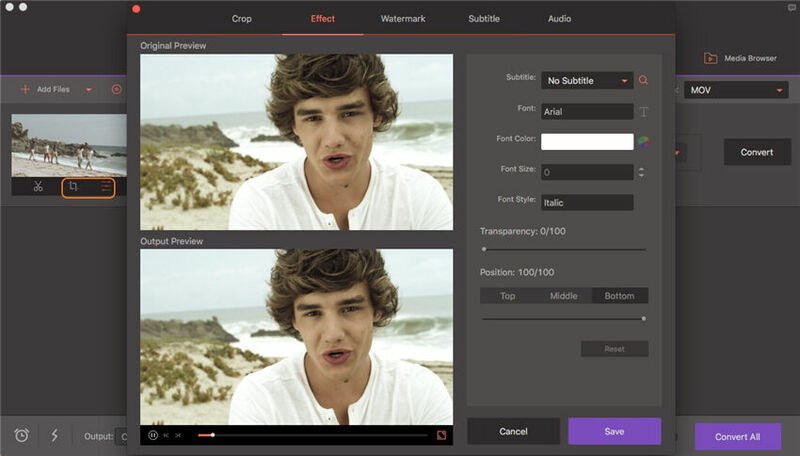 Then click the middle Crop or the right Effect icon to get the editing window. Click Subtitle in the top of the editing window, you’d get an interface as follows. Click the … button to import subtitles from your local computer if you have downloaded them beforehand. As an alternative, you can click the search icon to search subtitles online directly. 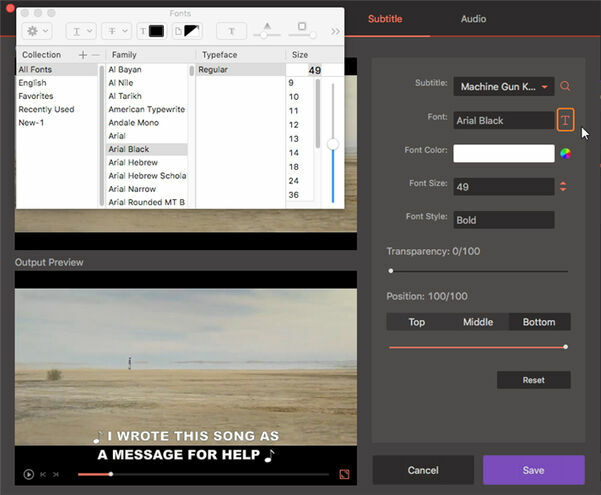 Now you can choose the font color, size, style and more for the subtitle, adjust subtitle transparency and position to your preference. Click OK to save all changes. Click the drop-down button beside Convert all files to: to choose an output format and click Convert All to start converting. Once completed, you'll get the video file with subtitles under Converted tab. Tips: If you want to adjust the video volume, just click the Audio in the top of the editing window. Similar to Windows version, you need to click + Add Files to add the video that you want to add subtitles to the program first. 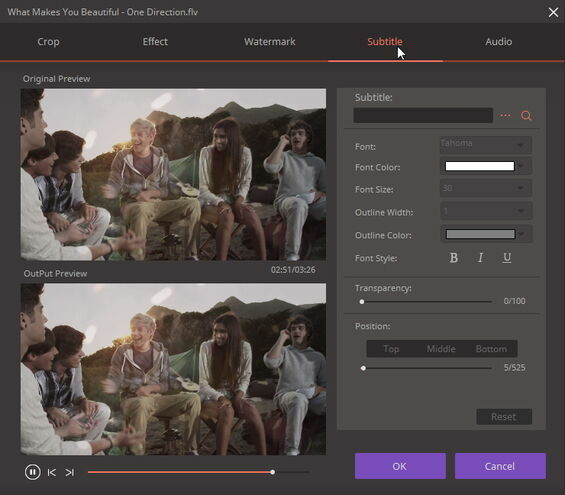 There you can see the general video information from the primary interface, including file size, video resolution together with No Subtitle. Click either one editing icon below the video thumbnail to get the editing window, and then switch to Subtitle tab just as the screenshot shows. Now you can follow the guidance in turns to add or edit subtitles as you need. Import Subtitle. You can click besides Subtitle: and select Add Subtitle to import your local subtitle. You can also click the search icon to search subtitle online right away. Set Subtitle Font. Click T beside Font:, then you'd get a pop-up window where you can select your desired font style as well as font size. Adjust Font Color. 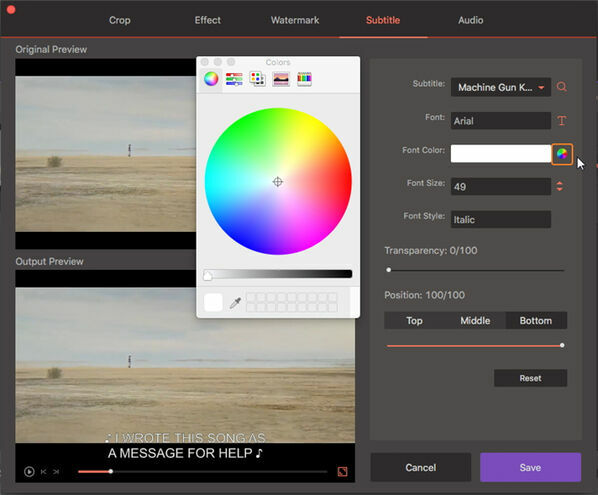 Click the colorful circle icon beside Font Color:, then you'd get color draw with which you can pick your favorite color for the subtitles. Note: You can also set the transparency and position of the subtitle. In addition, one click on Reset button would cancel all previous subtitle settings, be careful with this button. Once you're satisfied with subtitle settings, please click Save to proceed. You'd return to the primary interface with the subtitle name, just as circled in the screenshot. 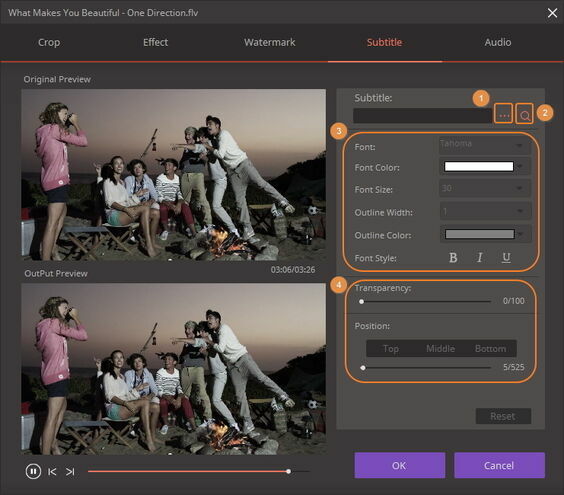 Now convert the video to your desired format and wait till the conversion completes, you can switch to Converted tab or click the folder-like icon to get the video embedded with subtitles.